There are timeless jokes about Washington being built on swampland, or as a site for hazardous duty pay for diplomats before the advent of air conditioning. 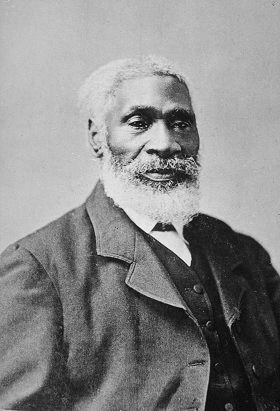 And, not far from where I live, Josiah Henson, the actual runaway slave, who was called Uncle Tom by Harriet Beecher Stowe, toiled away in the murky heat of Bethesda. That heat and humidity is why I planned a summer vacation and anniversary celebration with my wife, daughters, and their families in a large, rented house on Tupper Lake in the Adirondacks. We have headed somewhere north in summer for many years – in search of loons and moose and nesting warblers, and cool breezes, as we kayak or canoe where eagles soar and you need a campfire beneath the stars. Tupper Lake is just 80 miles shy of the Canadian border, about 500 miles north of our suburban Washington home. As you near the Adirondacks, the landscape shifts toward ancient, low, green mountains, pines and birches, rocky streams, and then lakes, ponds and bogs. 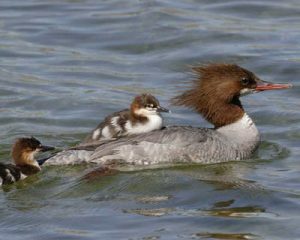 On our first day, we see two different common merganser mothers just off our dock – one with five ducklings, the other with eleven, a few riding right on Mommy’s back. 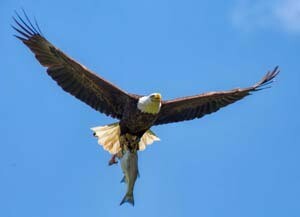 A bald eagle sails overhead in razor-sharp sunlight, a fish clutched in its talons. Loons cackle in the distance. Soon one bobs up from below the surface of the dark, tannin-laden waters and lets us see its white necklace of Native American legend. With small grandchildren around, we watch the well-stocked feeders on the lawn near the deck as well. I spy a dark-eyed junco underneath one, picking through the grass to get at smaller seeds that have fallen to the ground. As it hops and flies a bit, I point to its twin white tail stripes, revealed only when it moves. The grandkids struggle with oversized binoculars. We watch it with our eyes. 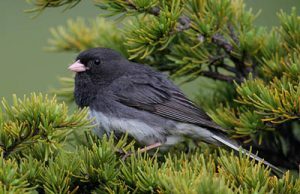 Juncos were the first bird that Caryn and I identified many, many years ago while camping in Canada looking for those elusive moose. Only little dark birds were to be seen –until they flashed those stripes. We have been birding and heading north ever since. I want my grandchildren to have the same sense of wonder that comes with discovering a species never noticed before as they wander in the woods. Now a pair of white-breasted nuthatches amuses our little group, as they yank up and down the trees. Then they steal away with one sunflower seed at a time. We have nuthatches at home, but I know I am really in the north when a slimmer nuthatch that makes tiny tin horn noises lands on the feeder. 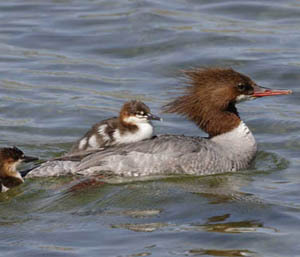 It has a rosy wash on its breast and dark eye lines on its head. It, too, steals a seed, flies off, and returns. 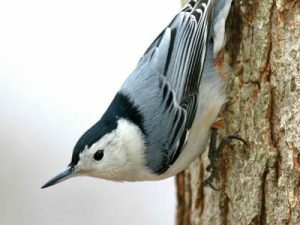 This small, red-breasted nuthatch is found only in northern woods. It is a “boreal” bird – a fancy term that means that it is smart enough to summer in Canada and New England. My very first one landed suddenly and gently on my hand in Algonquin Provincial Park in Ontario long, long ago. 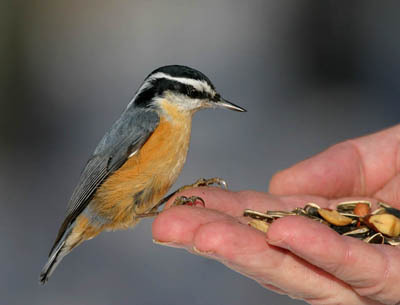 Only after I marveled at this tiny, gorgeous being seeking me out and tickling my palm did I see a cabin where I met a Canadian guy in a flannel shirt; he had patiently taught my little nuthatch to trust him and drop into his hand. The grandkids soon squeal over the chipmunks darting about, their cheeks stuffed with seeds and puffed out like balloons. Then there are “oohs” and “aahs” as another darling northern species that has been making high, extended chuckling noises above us heads in for the seeds. 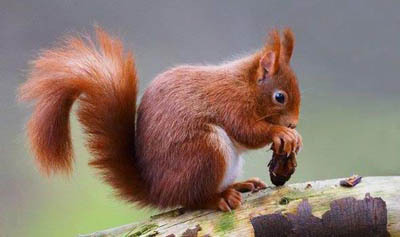 It is a red squirrel, less than half the size of the typical gray squirrels of city parks — with a pale, creamy eye ring that gives it a look of cute, wide-eyed innocence. Red squirrels like forests, especially pine, store up young pinecones to eat later, and do not live where it is hot. Every natural sign here tells me that we have reached the north, that the hazardous duty of summer in Bethesda has been left far behind. Even the butterflies are from the north. I can see that the abundant flowers along the steep boulder-lined steps down to the lake are weeks behind our garden at home. Cranesbill is in full flower. Ours closed up shop weeks ago. As I look, a black butterfly with white stripes flutters by me. I know it does not frequent my backyard. I note how the stripes run, take pictures, and then see a thin, but luminescent line of blue around the bottom of its wings. Another joins the first and they float around me and land on flowers up and down the walk. 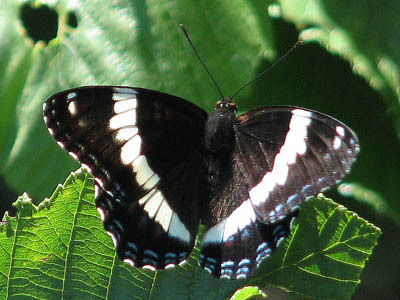 I am looking at what will turn out to be our lake house’s most common butterfly – a White Admiral. In my neck of the woods, I see Red Admirals, which are widespread, along the C&O Canal where their larvae feed on nettle. The White Admiral caterpillar, in contrast, feeds on birch and aspen leaves in deciduous woods at the edge of forests. 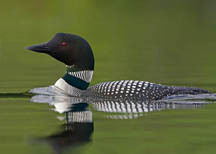 Like the other critters here, it is fond of northern, mountainous woods and ranges from New England far up into Canada. My final clue that I have reached the north is far easier to notice. 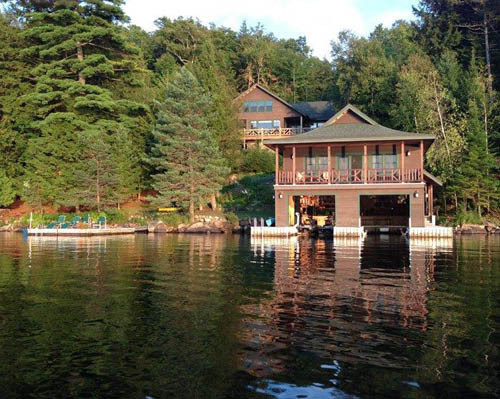 The exquisite Adirondack home that we have rented has a huge, central stone chimney — and no central air conditioning. It even has a fire pit outside, made of small boulders, above the boathouse. We never get to use the fireplace and only suffer, sweating, through one evening making s’mores by a bonfire. It is just too damned hot. I have reached the Adirondacks, the lakes and the loons. But I have not escaped the heat. We spend much time in the water, hikes grow shorter, cooking in the un-air-conditioned kitchen becomes enervating – daytime temperatures stay in the mid-nineties and reach a high of 97°. My family and the northern species here at Tupper Lake could try to head further north, but it would do no good. The local folks note that they are sorry we got a heat wave for our visit. Then I read that the Adirondacks are not alone. Montreal suffers its highest temperature in recorded history, 97.8°F. Seventy people, mostly elderly, die. But, it is not just the Northeast breaking heat and humidity records. Los Angeles hits 111°. Denver is at 105 degrees. Even Siberia is in the 90s, forty degrees above normal. Africa records its highest heat ever reliably measured – 124.3 degrees in Ouargia, Algeria. Roads buckle in Great Britain and the roof melts at the Glasgow Science Centre in Scotland. The extreme heat and humidity is truly global. There is no respite. Such extreme weather is, in the words of cautious scientists and some media, “consistent” with global climate change, But there is no doubt that each year sees higher concentrations of greenhouse gases and increased global mean temperatures. It is clear that, when I can, I head to the lakes and woods and bogs, look at birds and butterflies, and listen to the loons, not just to try to escape the heat, but, for a time, to escape the news and my work trying to protect the planet. The news is not all bad, I tell myself, preparing to return to Washington. Everyone I speak to on my vacation, in small stores, the ice cream stand, the Adirondack Museum, the parks and trails, is not simply talking about the heat. They nod, agree, laugh, or ask for more information, when I mention or sometimes lightly joke that this heat wave must be due to global warming. Anecdotal evidence, we are trained to note, is not sufficient, and there is the danger of selection bias, small sample size and more here in my simple opinion survey in upstate New York. The locals and the visitors are all here because they love the beauty of the land, the lure of the lakes, and the lack of heat. Then I spy a final item that does seem to support my observations and give me a flash of hope. Belief in the science and reality of global climate change has just reached a new high in the United States, despite the organized denial from corporations, ideologues, and the White House. And, analysts believe, it is because more and more Americans are seeing and feeling the results of climate change — flooding, rising seas, stronger hurricanes, forest fires, asthma attacks, and, yes, the sweltering summers — for themselves.